“O Come let us sing unto the Lord: let us make a joyful noise to the rock of our salvation.” (Psalms 95:1) If you are an adult (age 18-100), and you can make a “joyful noise” singing, you can be in the FBCR Adult Choir! This non-auditioned choir rehearses on Wednesday evenings from 7:30-9:00 and childcare is provided. The choir sings during each Sunday morning worship service. They also perform an Easter cantata in the spring and a Christmas worship presentation. 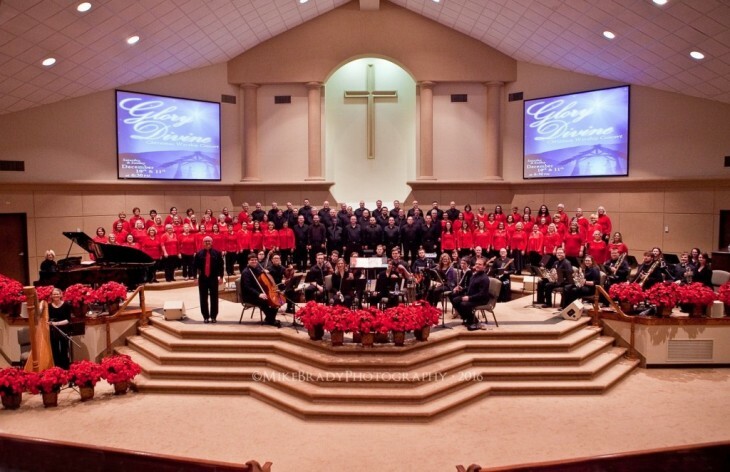 In addition, the choir accepts invitations to sing at events all over the tri-state area in order to take the name of Jesus Christ everywhere possible. If you would like to know more about possibly joining this non-auditioned ministry please contact Jim directly at jim@fbcrussell.org for more information. Regular rehearsals are on Wednesday nights from 7:30-9:00 in the sanctuary choir loft. New members are always welcome, so come and join us! “Praise God in His sanctuary…praise Him with the sound of the trumpet…praise Him with stringed instruments and organs…praise Him upon the loud cymbals…” (Ps. 150). If you have experience playing a musical instrument—play it to praise the Lord in the FBCR Orchestra! Presently, the orchestra is comprised mostly of keyboards, guitars, and drums. However, we hope to add brass, strings and woodwind instruments in the near future, when the space permits. The orchestra’s principal responsibility is to accompany the congregation and choir during worship services. They also accompany the choir for concerts and seasonal presentations. The orchestra practices with the choir on Wednesday evenings from 7:30-9:00, and childcare is provided. Use your instrumental talents to praise God in His sanctuary! Contact Jim Wilcox to discuss the opportunities available to participate in this ministry.